EK Success Circle OR Square Scrapbook Craft Punch Sizes Vary SELECT YOUR DESIGN! 4 out of 5 stars - EK Success Circle OR Square Scrapbook Craft Punch Sizes Vary SELECT YOUR DESIGN! 4 product ratings4 product ratings - EK Success Circle OR Square Scrapbook Craft Punch Sizes Vary SELECT YOUR DESIGN! EK Success Tools Embossing Stylus Set 3 Sizes Cards NEW! The Embossing Stylus set is designed to emboss paper to create raised designs and patterns, or use the stylus tool to trace patterns and designs onto a surface, or as a dotting tool for nail art. 2 sizes on each of 3 tools. 5 out of 5 stars - EK Success Tools Embossing Stylus Set 3 Sizes Cards NEW! 1 product rating1 product ratings - EK Success Tools Embossing Stylus Set 3 Sizes Cards NEW! Like new condition. Never used. EK Success Scallop Paper Shaper Punch Scrapbook Tool SELECT YOUR DESIGN! EK Success / EK Tools. 54-30163 Flowers and Leaves Large Slim Punch. Locks closed for simple storage. After you do that I'll be notified of the sale and will receive your request for an invoice. Trending at $16.18eBay determines this price through a machine learned model of the product's sale prices within the last 90 days. Layering Punch - Make Multiple Shapes. Creates 3 coordinating designs with one punch. Slide switch to choose design layer. Locks for stackable storage. 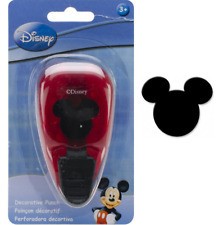 EK Tools Mini Paper Shaper Punch 2 Pack Set SELECT YOUR DESIGN! Model Number: EKS5420077. Manufacturer Part Number EKS5420077. Product Model EKS5420077. Manufacturer: EK SUCCESS. Manufacturer EK SUCCESS. QUICK OVERVIEW. Item#: 5114806. Use individually or interlock layers together for a unique look. These easy-to-use punches feature a paper guide so you know you are aligned correctly, and the compact design locks shut for storage. Ek Tools - Powder Tool. EK Success Tools Medium Moon And Stars Paper Shape Punch Card Art NEW! Features crescent moon and stars. Perfect for card making, scrapbooking and any paper craft. Perfect for paper crafters of all skill levels. Scrapbooking, greeting cards and all papers crafts benefit from the versatility and fun paper punches add to any project. EK Success Tools Scalloped Scallop Edge Punch Scrapbook Card Art NEW! Create a die-cut pattern with ek tools Scalloped Scallop Edge Punch. Design stunning gifts, cards, scrapbooks and photos that show off your creative style. Locks for storage. Features scalloped scallop design. 5 out of 5 stars - EK Success Tools Scalloped Scallop Edge Punch Scrapbook Card Art NEW! 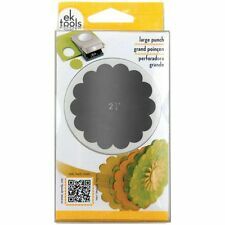 2 product ratings2 product ratings - EK Success Tools Scalloped Scallop Edge Punch Scrapbook Card Art NEW! Nesting punch is uniquely compact and easy to use. EK Success Circle 3/16" Small Paper Punch. I do not have information about other countries. Trending at $5.32eBay determines this price through a machine learned model of the product's sale prices within the last 90 days. 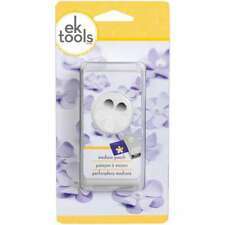 EK Success 3/16" Circle - These punches provide an easy way to make perfect shapes for all your scrapbook; card making and craft projects. They feature a punch lever that is gentle on your hands. "Nesting" is a line of EK Success punches that are same shapes in slightly smaller or larger sizes so they "Nest" inside each other like a bullseye. Punch = 5.25" x 2.75" x 1.25". Gently Used. Punches paper with ease does not stick, etc. Cut Out =. 5" x 1.75" Repeats for Border Effect. Perfect to use for cards and scrapbooking. EK SUCCESS-Paper Shapers Large Punch. These punches create gorgeous shapes and border art! The large punches are easy to use and lock closed for simple and safe storage. Manufacturer EK Success. "Large Punch-Scallop Circle 2.25""". EK Success / EK Tools. 54-30234 Jar Large Slim Punch. After you do that I'll be notified of the sale and will receive your request for an invoice. Locks closed for simple storage. Trending at $16.26eBay determines this price through a machine learned model of the product's sale prices within the last 90 days. Punches lock shut for storage. by EK Success/EK Tools. mini punches set. HEART AND STAR. Approximate Punched image sizes: 5/8" each. Great for on the go crafting or around the house. Use for scrapbooking, card making, paper crafting and general crafting. EK Success Tools Medium Paper Punch Shape Scrapbooking SELECT YOUR DESIGN! 5 out of 5 stars - EK Success Tools Medium Paper Punch Shape Scrapbooking SELECT YOUR DESIGN! 1 product rating1 product ratings - EK Success Tools Medium Paper Punch Shape Scrapbooking SELECT YOUR DESIGN! Mini corner paper punches. Perfect for paper crafters of all skill levels. Scrapbooking, greeting cards and all papers crafts benefit from the versatility and fun paper punches add to any project. Select from a variety of shapes and styles. EK SUCCESS-Nesting Paper Punch. The Nesting Paper Punches are uniquely compact and easy to use for any paper project. They lock closed for stackable storage and create a precise basic shape for your project. Use for scrapbooking, card making, decor/decorations, banners. "EK SUCCESS-Slim Edger Punch. These punches create gorgeous border art! The Slim Edger Punches are easy to use and lock closed for simple and safe storage. Punches are constructed of steel and plastic. EK Tools Heavy Duty 1/4 in. Circle Punch 54-10043. EK Success / EK Tools. I find it much easier to use than a standard hole punch. 54-10043 Heavy Duty Hole Punch. 25". Compact & easy to use. After you do that I'll be notified of the sale and will receive your request for an invoice. EK Success Tools Heavy Duty Vertical Slot Hand Punch Scrapbook Card Art NEW! You will love our products, and you will be delighted by our friendly, personal service! EK Success / EK Tools. 54-30099 Butterfly Large Slim Punch. Locks closed for simple storage. After you do that I'll be notified of the sale and will receive your request for an invoice. EK Tools Paper Layering punch Butterfly 54-90020 5490020. button (at the top of the page). EK Success / EK Tools. Set of 2 mini punches. Flower & Retro Flower 2 pc. Mini Punch Set. This Flower & Retro Flower Mini Punch Set is a must-have for your creative projects! Lock closed for simple, stackable storage. EK TOOLS LARGE Punch ELEGANT DEER. Nesting punch is uniquely compact and easy to use. EK Success Circle. I do not have information about other countries. "EK SUCCESS-Classic Punch. Imported.". Manufacturer EK Success. Sales & Specials. Product images are for illustrative purposes only and may differ from the actual product. Due to differences in monitors, colors of products may also appear different to those shown on the site. 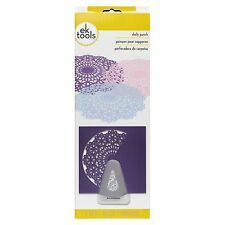 EK Success Tools Doily Eyelet Starter Punch Scrapbook Card Art NEW! EK Success doily punch starter set (includes the base and one doily design) does work with the Martha Stewart doily punches. This newly designed punch cuts shapes even more detailed and beautiful than the Martha Stewart ones did. 5 out of 5 stars - EK Success Tools Doily Eyelet Starter Punch Scrapbook Card Art NEW! 2 product ratings2 product ratings - EK Success Tools Doily Eyelet Starter Punch Scrapbook Card Art NEW! Trending at $35.91eBay determines this price through a machine learned model of the product's sale prices within the last 90 days. EK Success Tools Medium Moon And Stars Paper Shape NEW! EK Success Tools Medium Moon And Stars Paper Shape NEW! Great for scrapbooking, card making, paper crafting, kids crafts and more! Comes from a smoke free and pet free home. Thanks for looking! Simply pick out colorful papers from your stash and punch away. Overall punch size: 5" x 3.125" x 1.25". Zinc and ABS. EK Success / EK Tools. 54-30268 Double Hello Large Slim Punch. Use the punched Hello and the negative space Hello. Locks closed for simple storage. After you do that I'll be notified of the sale and will receive your request for an invoice. EK SUCCESS LARGE REAL ESTATE SIGN PUNCH. Ek Tools combined lot $80.00+ Retail Value! NEW in packages!! Com inef auction lot! 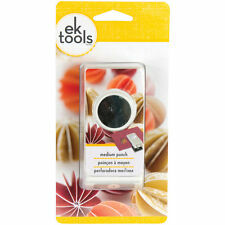 Included: Ek Tools Mini Punches(heart and star) Corner Rounders , large butterfly and 1 1/2" circle punch! Condition is New. Shipped with USPS Mail. Button (at the top of the page). all 50 U.S. States, Puerto Rico & APO/FPO. EK Success Tools Large Flourish Label Punch Scrapbook Card Art NEW! Features EK Punch Large Flourish Label. Large punches from EK tools are a crafter's must have. The easy lever design makes multiple punching simple. Locks closed for convenient, stackable storage. Punch locks for compact stacking and storage. EK Success E5430106 Large Punch-Retro Flower, 2"